Once the catheter or needle reaches the chorionic villi, your surgeon withdraws a small sample and carefully removes it from the uterus. You should receive Rh immune globulin (RHIG) at the time of CVS if you are an Rh-negative unsensitized patient. The sample is sent to a laboratory. How the lab technicians handle the sample depends on the genetic abnormalities they are looking for and the type of technology they use. 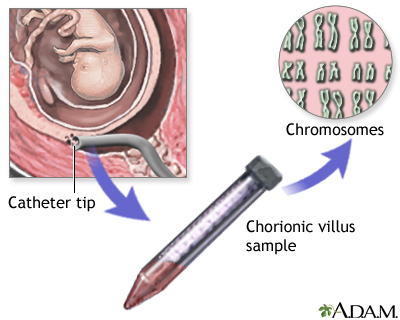 They will extract chromosomes from the sample's cells to find out if your fetus is carrying any genetic abnormalities. In most cases, your health-care provider will have your test results back within two weeks. The results can help you and your partner decide whether to carry the pregnancy to term, or how to prepare for the baby you will deliver.